I’m overdue in sharing news from the Northborough-Southborough district’s Special Education Parent Advisory Council. This Friday is the deadline for “Go the Distance Award” nominations. And I never posted that a special reading workshop scheduled for March 2nd was reschedule due to snow. There’s also a regular monthly meeting this week. More details on each NSPAC news item are below. Please complete the form [here] to nominate one individual who has made a positive impact in your child’s life during this current academic year. This person can be a bus driver, teacher, cafeteria worker, paraprofessional, support staff member, another student, or community employee (such as a hairdresser, coach, dance teacher, or librarian). It should be an individual who has made a significant contribution in enhancing the life of your child. Everyone nominated will be recognized. Any family member or guardian of a child with special needs in the Northborough or Southborough Public School District is free to submit a nomination. The nomination can also be made by the child or in the name of your child. We are only accepting ONE nomination form per family/per child who is currently on an IEP or 504 plan. If you have two children on an IEP or 504 plan, you may make one nomination for each child; however, a separate form must be completed for each nomination. The deadline to submit a nomination is Friday, April 12, 2019 at 7 p.m. Nominations received after this date and time cannot be accepted due to planning purposes. Sorry, no exceptions. Back in February, I posted about a special workshop co-sponsored by NSPAC. The new date is this Saturday, April 13th, 1:00 pm at Northborough Library, 34 Main Street. 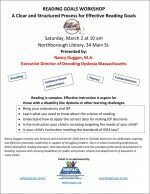 The presentation subtitled “A Clear and Structured Process for Effective Reading Goals” is something parents of children with dyslexia will want to note. But it is also intended for parents of children with other learning disabilities. Reading is complex and effective instruction is urgent for those with a disability like dyslexia or other learning challenges. . .
You will learn what you need to know about the science of reading, understand how to apply the correct data for making Individualized Education Program (IEP) decisions, know if the instruction your child is receiving is targeting the needs of your child, and know if your child’s instruction is meeting the standards of the Individuals with Disabilities Education Act (IDEA) law. Parents are encouraged to bring copies of student evaluations and IEPs. The event is co-sponsored by the SPACs for Shrewsbury and Westborough. That means there may be a lot of attendees, so RSVPs are encouraged. Please email NSPAC at nspac1@gmail.com. Nancy Duggan recently was honored and received the 2018 Alice H. Garside Award for her dedicated, inspiring, and effective grassroots leadership in support of struggling readers. She is a school counseling professional, Orton-Gillingham reading therapist, and educational consultant and has provided professional development in reading, dyslexia and learning disabilities for public and private schools and departments of education in many states. 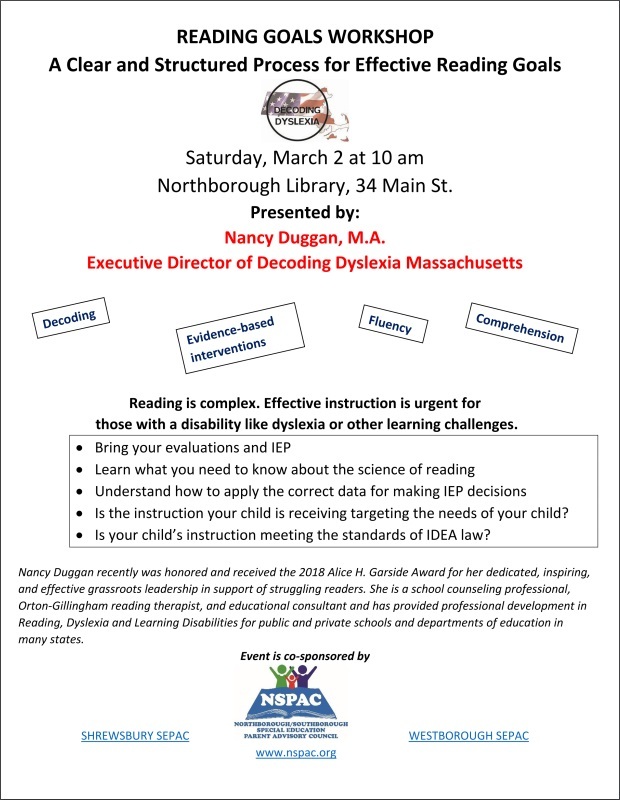 Most recently, Nancy’s dedication, drive and knowledge helped to pass the first legislature in Massachusetts for early screening for dyslexia. You can find out more about her organization here. For more information on NSPAC, click here. *These morning sessions are open meetings and all are welcome to attend. However, you are asked to please use the proper channels to discuss any individual IEP or 504 concerns.